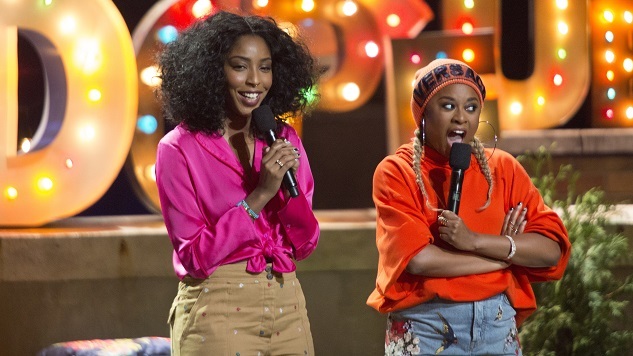 When it launched in 2016, actress-comedians Phoebe Robinson and Jessica Williams’s podcast 2 Dope Queens became the cathartic release that so of us many needed: two well-educated black women talking unapologetically about everything from hair care to U2. Most importantly, one of the most impressive things about their podcast is that it proved that people with varying backgrounds besides their own would tune in and care deeply about it. So it’s a no-brainer that HBO signed the duo for a four-episode live special. Premiering on February 2, not only are they all directed by comedy badass Tig Notaro, but they also spotlight lesser-recognized comedians and ask guest stars like Sarah Jessica Parker and Jon Stewart (Williams’ former boss on The Daily Show) all-important questions about things like pizza choices and hair care. “My favorite thing is when I get white dudes who come up to me and go ‘I really like 2 Dope Queens,” she says. Below are the ladies’ answers to other questions that we and other journalists asked during their press panel. How did the live shows keep the spontaneity of the podcasts while also factoring in the planning and pre-written scenes that a stage show necessitates? This also carried over to the live show’s celebrity guests. “When we have celebrity guests on the show, we like to ask them things like ‘what do you think about cocoa butter’—things that we actually think about,” Williams says. “What’s great about these guests is they were really excited to do the show and they were ready for anything. How did it come about that Notaro would direct all four episodes? How did they decide on the themes of the live episodes? Other themes are hot peen—because they both enjoy naked men—and “blerds,” or black nerds. For the uninitiated, much of 2 Dope Queens focuses on blerds. But how do they differ from white nerds? “There are so many layers to the black female experience and I think being a nerd—or a black nerd—is a part of that,” says Robinson, a professed Game of Thrones fan. Each special also includes performances by other stand-ups. How did they choose who would get to perform? Guest comedians are Michelle Buteau, Mark Normand, Baron Vaughn, Aparna Nancherla, Rhea Butcher, Sheng Wang, John Early, Jackie Kashian, Kevin Barnett, Naomi Ekperigin, Al Jackson and Gary Gulman. While the episodes were filmed before the #MeToo movement really took hold, it is there in spirit. Inevitably, some jokes are going to have to get cut from the special or podcasts. How do they decide what stays or what goes? “We have a lot of jokes in there, so as long as we have the narrative of each episode in place we can kind of take out jokes that derail us from that,” Robinson says. Williams and Robinson are working actresses and writers. How has the success of the podcast changed how they are cast on shows and movies? 2 Dope Queens premieres on HBO on Friday, Feb. 2.